Every movie fan knows this image. That iconic shot of Elliott on his bike and E.T. covered with a blanket in his front basket flying across a giant, light blue moon. 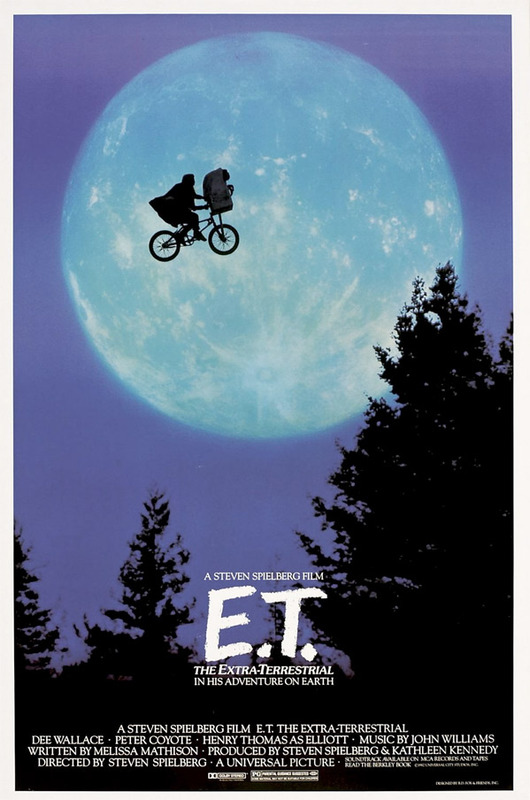 It was originally used on the poster for E.T. in 1982. The magical, instantly memorable imagery went on to represent Steven Spielberg's Amblin Entertainment brand being referenced directly in the logo. Well, Swiss photographer Philipp Schmidli recently decided to (re)create the iconic E.T. 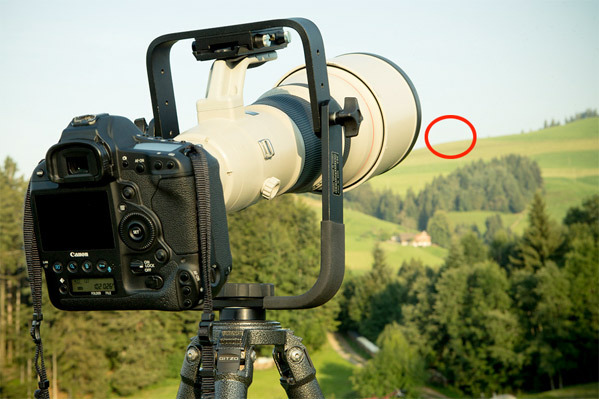 giant moon jump shot in real-life, and took to the hills of Switzerland to get the perfect shot (via Gizmodo). He finally pulled it off and posted the photo for all to see. Find it directly below. 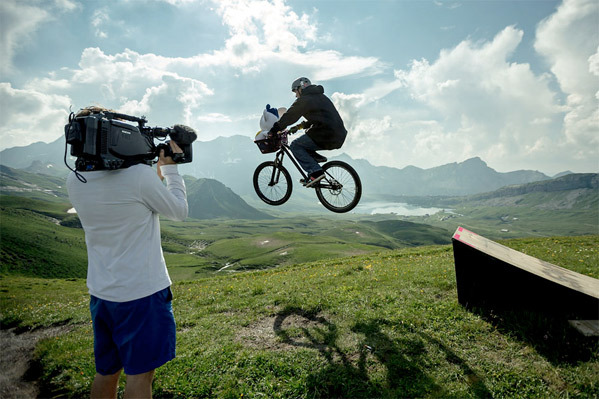 For more info on the photo shoot and how they pulled this off, visit Philipp Schmidli's blog. The story of what inspired Schmidli to go out and get this shot is covered (in English) on PetaPixel via Gizmodo. He used a Canon 1D X camera and an 800m f/5.6L IS lens (this thing is huge) with a 2x teleconverter to get the shot seen above. 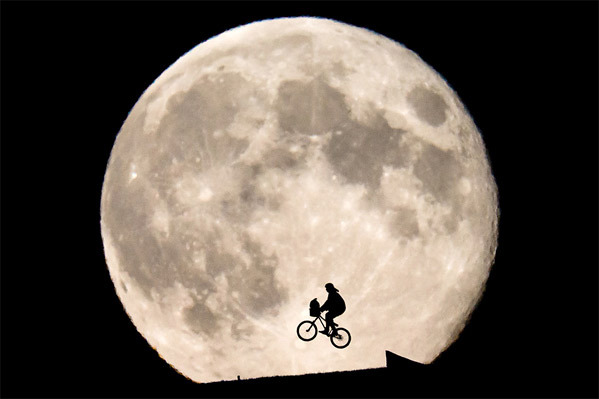 Schmidli recruited three bikers, built a ramp, and had them jump three or four times before the moon rose too high above the horizon. Did he get the perfect shot? (I think he did.) As a passionate fan of photography myself (I'm on Instagram as @abillington) I have to say this is awesome, what a fun experience and near perfect homage to an iconic image that will forever represent the magic of the movies. Good work. Aside from being an homage to a classic film and a fun way to keep the spirit of film alive I find it difficult to appreciate this photo and the purpose of this post. I'm all for seeing people express their love of film through different mediums but I (and the majority of the audience) come to First Showing to get movie news and other relevant information (such as the Scorsese lecture, Paramounts new independent branch, and even graphic artist who's body of work consists of film references). I understand that this is your website Alex and you determine what is posted but his kind of content seems more suitable for a more casual Tumblr-like blog. Something interesting that you want to share but isn't relevant to the film industry. I think this is the same thing as the recent backlash towards posts on short films (something I personally don't mind if they deserve the exposure). Folks come here for a reason, based on the previous content and that reason creates an expectation. So when there is something on the main page of Firstshowing their is a certain level of standard (high quality, insightful, unique, or interesting news bits) or genre (ie the film industry) that the content/information needs to adhere to or else it will disappoint. Which isn't good for the content or FS. This is why many news outlets refrain from posting every interesting thing on their primary outlet and save much for a secondary outlet. One that is more casual, personal, intimate and a place that the audiences standard are much lower and expect to get just little interesting things that the blogger finds interesting instead of prominent, relevant, news information. I'd love to hear your thoughts on this Alex as it seems this is something that you have been dealing with a lot recently. Have to say, that these kinda stories is what makes this site unique and just one of the reasons why I love FirstShowing - keep it up, Alex & Co. ! I'm surprised that you really think this photo is a lower than average quality post, and I'm sad to hear that you think this content would otherwise affect the integrity of the site. This is just a movie blog, we post cool content here, there aren't many other places to post about it. Sure we have social networks, but there's still a blog at the heart of things and I/we love posting about cool things that we find interesting. As you pointed out, it's "an homage to a classic film and a fun way to keep the spirit of film alive." So what's the big deal? What "purpose" are you looking for? It's just a blog, we post anything interesting all the time. Plus it's Sunday - there is no news anyway. While I appreciate the tips you offer, this is my site and I choose to run it the way I want and post content we deem worthy, no matter if it's on the home page or other page. If you want to run your own blog, start one, but I don't feel the need to post content just on a Tumblr alone when we prefer to share our content with everyone on this blog. I don't see any need to be a "Concerned Citizen" but thank you for honest the feedback. I'm more so using this photo as an example/opportunity to touch the topic of the posts that have gotten heat in the past, such as the short films debate on the most recent Dan Sachar trailer. I thought that it would be interesting to touch on the apparently split consensus of what people expect to find on the site. I undertand that cool stuff is posted from time to time but to me, its seems that the posts that get the most heat are the ones that don't directly relate to movie news or information. That is what I meant by of a "quality" or "standard". While I find the majority of post that don't pertain to news entertaining (it's always nice to see/be exposed to art work, artist, products, and other misc stories) I do feel that they seem out of place from the majority the content here. Again, I acknowledge that this it you site and you(and the gang collectively) solely deem what is worthy to post. But wouldn't you agree that the site is (or at least perceived by the public) as a movie news blog? That is why I feel the short film debate happened. Because people expect to find news regarding the film/entertainment industry and instead find short films (some of which aren't even in the festival circuit). If they were to see you sharing these films on a more casual outlet I don't think they would have had that response. Wouldn't you agree? The same with this photo. I would have never had a second thought about it if it was another blog, but since it was in context to the recent trend of opinions by viewers I thought to spark a discussion. Now I'm not telling you to go start another blog, I'm simply observing a trend of responses towards a few spesific type of posts on the site and offered a hypothetical alternative to hypothesize that those negative responses wouldn't occur. That is what I was truly curious to hear your opinion on. Hmm... I was expecting something a little closer to the actual movie poster. The recreation isn't even facing the right way.